Home » The dawn of christianity in Britain. A new power had already been in operation before the coming of the Saxons,—that power before which Rome itself disappeared, and to which the victorious Goth submitted, and so founded upon a rock the new empire which he was instrumental in establishing. Strangely as it seems to us, at the very time when the British Roman colony was falling to pieces, and like Rome itself was quickly to become the prey of an invader, the country was divided by dogmatists who disputed fiercely on the subjects of Christian doctrine, or on the less important observances and ceremonials. There had been a difference between the Welsh and the English Church on the mode of computing Easter, and a revival of this question threatened to divide the churches of Mercia and Northumberland from those of the other part of the Heptarchy, the former having been founded by Scottish missionaries, while the latter received their instruction from France and Rome. The fashion of priests’ tonsures was also a question which caused no little dissension. Animosity and ill-feeling prevailed till, at a council at Hereford in 673, the bishops agreed to observe the canons which Theodore had brought from Rome. The apostolic age had passed, and the orthodoxy of the Christian religion was made the excuse for quarrels as bitter and as violent as those that had distinguished the various septs and tribes of former years. It is true that when the Romans abandoned the island the gospel had not been preached in several parts of it; but it is equally certain that as early as the year 314, Eborius, Bishop of York, Restitutus, Bishop of London, and Adelphius, Bishop of Richborough, represented Britain at the council at Arles, so that these islands were then regarded as a province, like Spain and Gaul, with a fully acknowledged church authority. This church of Britain was considered to be orthodox on the authority of St. Jerome and St. Chrysostom; but first the Arian and afterwards the Pelagian heresy troubled it, and as Bede tells us, the clergy sent to Gaul for the aid of learned bishops who would refute the errors by which they were threatened. Eventually Germanus of Auxerre and Severus of Treves not only silenced their opponents but caused them to be banished. 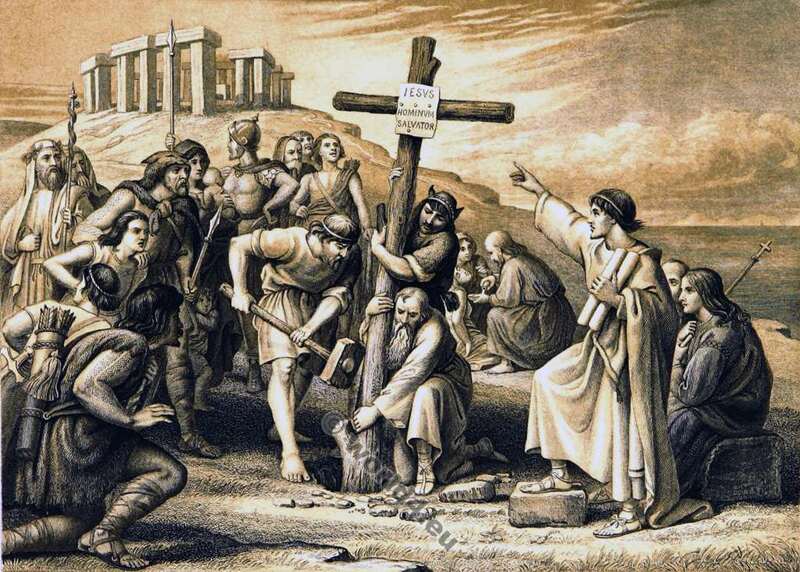 Apart from the accounts of these disputes, however, we have no authentic record of the first or even of the earlier introduction of Christianity to Britain. It may be said that the kingdom of God had come without observation; and though it was established only in some parts of the island, and the faith of the gospel was to a great extent mingled with legends and observances that belonged to the old superstitions, it had begun to exercise its influence over the hearts and lives of men. Alban, the Roman officer and first English martyr, had been beheaded probably as early as a.d. 303, during the persecutions of Diocletian, and his conversion was attributable to the instrumentality of a priest whom he had carefully concealed, in order to shelter him from his assailants. The Roman governor heard that the priest was in Alban’s house, and sent soldiers to take him prisoner, but the generous Christian host had provided a safe retreat for his friend, and presented himself dressed in the priest’s clothes. He was led before the governor, and declaring himself to be a Christian was scourged and afterwards beheaded; but it is said that his holy demeanor and his serene and cheerful courage converted to the Christian faith the soldier who was appointed to be his executioner. It is to Saint Augustine, the first historical missionary to England, that attention is usually directed when we speak of the planting of Christianity in this country, and with him we necessarily associate the Great Pope Gregory, who, long before he had succeeded Pelagius II. in the papal throne, had manifested an intense desire to preach the gospel to the English people, who, it must be remembered, were no longer Britains but Anglo-Saxons. Most of us have heard or read the fine old story of Gregory’s walk through the slave-market at Rome, and the immediate occasion of his effort to promote a mission to England. The legend is nearly thirteen hundred years old, but it remains as a part of the national history, and a record of the Christian charity and love for children, which were distinguishing characteristics of the Great Pope. Gregory was but a monk of the convent of St. Andrew on the Coelian Mount, rising just behind the Coliseum, on that memorable day, the exact date of which is lost, when, amidst the crowd of African negroes, swarthy Egyptians, and lithe keen-eyed Greeks, who were ready to be sold, he noticed three fair boys, whose blue eyes and flowing flaxen hair—no less than the beauty of their features and their shapeliness of limb at once arrested attention. The monk stood gazing thoughtfully at the group. “Whence come these strange beautiful children?” he inquired of the slave-dealer. * The tract of country between the Tyne and the Humber—Deira, the land of the wild deer. Alfred the Great Viking chieftain.